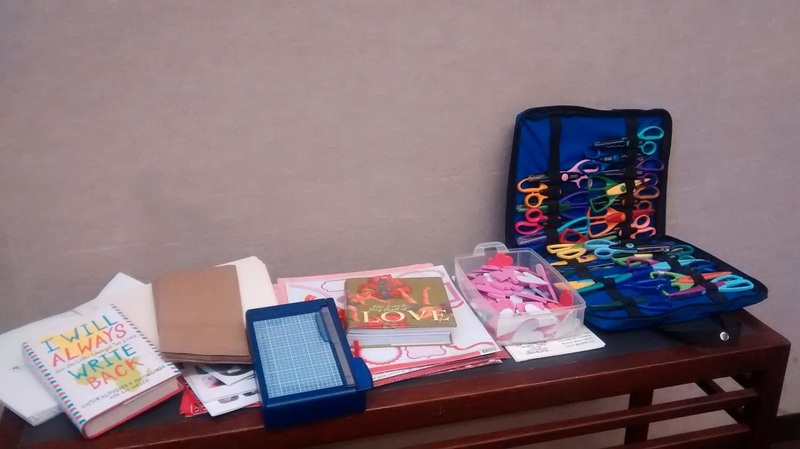 On a rainy Sunday afternoon, at the end of January, eight ladies gathered in a side room of the Gresham (Oregon) library to write letters, make cards, create envelopes, design Valentines, share supplies, eat tasty food and, of course, have fun. It was the first meet up of the Oregon-based League of Extraordinary Penpals. It was a wonderful time—but it had its share of frustrations and complications along the way. I came up with the idea one afternoon when Nicole Orr, another LEP-er (as well as best friend and daughter) and I were getting out Valentine’s Day supplies. As usual, I had far more than I needed, and so I thought, wouldn’t it be fun to share these with other letter writers? Where would it be hosted though? There was my house but that meant I would spend the next two weeks cleaning frantically, which is never fun. (Cleaning and fun ARE oxymorons, right?) I called the library closest to my house and reserved their meeting room. One problem solved. Next, I went to my LEP database and looked up anyone living in Oregon. 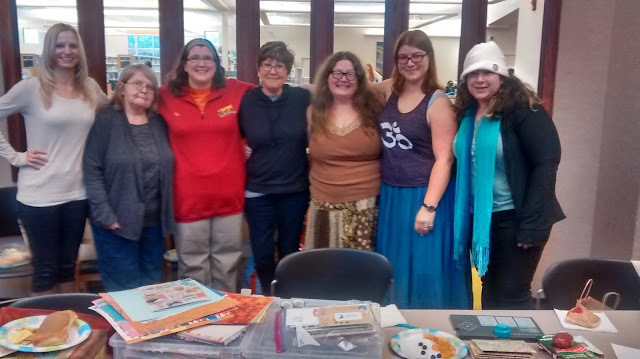 I invited my already-made pen friends Jen Chastain-Escalante, Tee Cary, Christine Mauser, and Teri Staudinger. (And Nicole Orr, of couse!) I asked everyone to invite other pen friends. Teri brought Doris. I brought Jennifer (from The Letter Writer’s Exchange). The morning of the meeting, I called the library to verify they provided tables and chairs. They found no indication of my reservation. Panic, panic. I told them I had email confirmation and they quickly put me down on the schedule. When I arrived at the library, they had—once again—misplaced my reservation. They gave me a much smaller room, which was a challenge to arrange to accommodate eight people, endless paper supplies and tons of food, but we managed. For two and a half hours, LEP-ers and non-LEPers cut, punched, glittered, wrote, stamped, double-face taped, and glue dotted. We nibbled here and there too, but mostly we talked, laughed, shared, and got to know each other face to face instead of just on paper. It was a wonderful time, and we parted already discussing what we would do at the next one, tentatively scheduled sometime in early March. (Spring! Easter! St. Patrick’s Day!) I can’t wait to do it—and thank you SO MUCH. 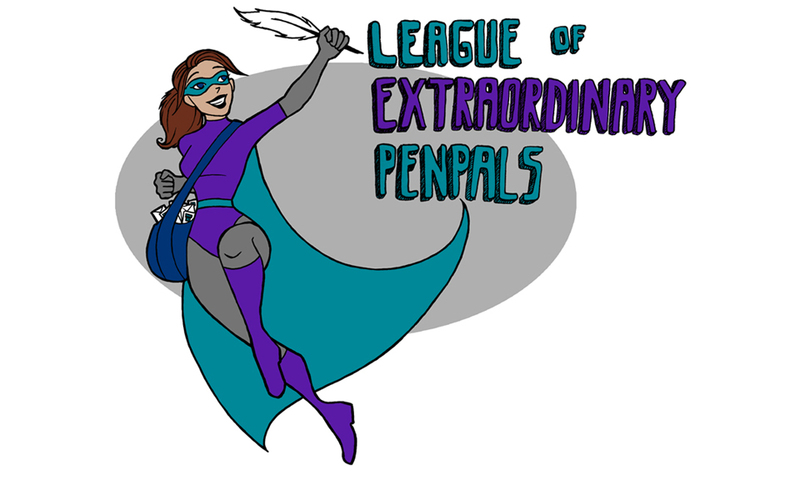 League of Extraordinary Penpals, for bringing us together in the first place. Oh, and any Oregon or Washington area LEP-ers, if you want an invite to the next get-together, just email me directly at writinggoddess2@comcast.net and I will put you on the list.